Important! Secure Site SSL includes access to our premier certificate management platform, CertCentral, to help you easily manage all your Secure Site features. Already have a DigiCert account? Log in to see if you're eligible for a free upgrade to CertCentral. Good News! Your account is eligible for a free upgrade to CertCentral and will be upgraded after completing your order. Protect your web or email traffic with strong 2048-bit SSL encryption using a DigiCert Standard SSL Certificate. When you buy www.example.com, we give you example.com as a free SAN. Order now and for the next 90 days buy additional EV certs on the same domain for only $155.00 USD for 2 years or only $95.00 USD for 1 year! See the difference when visiting an EV-secured site. Base price includes 4 FQDNs. Additional names are only $135.00 each. Additional names are only $135.00 each. 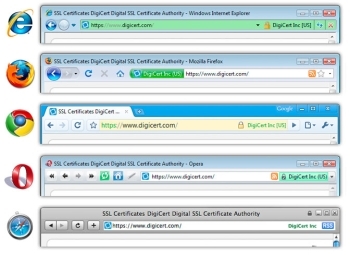 Secure unlimited servers with one SSL certificate (*.example.com) using a DigiCert WildCard certificate. Base price includes the default logo and one friendly name. Additional logo and friendly name language codes are only $69.00 each. Base price includes 4 FQDNs. Additional names are only $69.00 each. Complies with the U.S. Federal ESIGN Act, making your documents legally binding. Protect your website or email traffic with industrial-strength 2048-bit encryption with a Secure Site SSL Certificate. Priority validation – Secure Site certificate orders are automatically placed at the top of our validation queues allowing our validation agents to respond to these orders first. Priority support – Secure Site certificates come with access to a “priority” support queue allowing our support agents to respond to your needs first. Two premium site seals – The two most recognized trust marks on the web are included with every Secure Site certificate: DigiCert and Norton Secured. Pick the premium site seal you want to use to display proof of trust on your site. Malware check – Each Secure Site certificate comes with convenient access to a VirusTotal malware check. Quickly analyze your public domains with 70 plus antivirus scanners and URL/domain blacklist services. Use scan results to identify malware threats so you can take actions to keep your site off blacklists that can cripple site availability and online revenue. Industry-leading warranties – Secure Site certificates include warranties to protect you and your customers: a $1.75M Netsure Protection Warranty for your business and an industry-best $2M aggregate Relying Party Warranty for your customers. Secure Site Extended Validation (EV) SSL Certificates protect your most valuable assets–your customers and your brand–from phishing scams and online fraud. Secure Site Multi-Domain SSL certificates use Subject Alternative names (SANs) to secure multiple sites (that is, fully qualified domain names) with one certificate. Secure Site Extended Validation (EV) Multi-Domain SSL Certificates protect your most valuable assets–your customers and your brand–from phishing scams and online fraud. These certificates use Subject Alternative Names (SANs) to secure multiple sites (fully qualified domain names) with one certificate. Secure Site Wildcard SSL Certificates secures unlimited servers with one certificate (*.example.com). Increase shopping cart conversion rates, enhance user trust, and get the 'Green Bar' on the most important areas of your website. Secure your high trust areas with EV and the remainder of your domain with Wildcard Plus. Includes an additional EV SSL Plus certificate on your base domain for 40% off regular EV pricing. Note: Your EV Certificate will have a validity period of 2 years. To secure https://www.example.com, your common name must be www.example.com or *.example.com for a wildcard certificate. The common name will also be listed as the first SAN in the certificate. All domains should be owned by the same company. If they are not, we will need to ask for approval from the domain owners during the validation process. If you need SANs, click here to add them. Why? Some mobile clients, including Windows Mobile 5, do not support wildcards, but they do support Subject Alternative Names. DigiCert lets you add SANs to your wildcard certificate to be Windows Mobile 5 compatible. Also, wildcard certificates only secure the first level of subdomains. Here, you can specify names as many levels deep as you need, to really cover your entire domain. Selecting the correct platform helps us issue your Code Signing Certificate in the correct format, but the certificate can be used to sign code for any of the listed platforms. Important: You must have one of the approved hardware tokens listed in the box below. You will not be able to install the certificate on any device that is not on the list. If you don't have one of the approved tokens, please select the option to have a preconfigured hardware token shipped to you. If you have any questions, please contact us. (Optional) I would like to provide my CSR now. (Optional) I would like to provide my CSR and auto-fill names now. View/Edit CSR	What is a CSR? Before we can issue a certificate, you will need to generate a Certificate Signing Request or "CSR" on your server and submit it to us. You may submit an RSA or ECC-based CSR. For most platforms we can use the built in functionality of your web browser to automatically generate a Certificate Signing Request, or CSR, for you when your Code Signing certificate is issued. For some platforms, like Java, it is often easier if you generate the CSR yourself and submit it now with your order. What should I use as the Common Name? To remain secure, certificates must use 2048-bit keys. Please contact us if your platform can't generate a 2048-bit key. For more information, see this explanation. Selecting the correct platform helps us issue your Code Signing Certificate in the correct format, but the certificate can be used to sign code for any of the listed platforms. After your order has been placed, DigiCert will send an authorization email to the registered owners of the domains listed above. This email will only be sent for names that are public. DigiCert will also send the authorization email to the admin, administrator, webmaster, hostmaster, and postmaster accounts for each public domain in the certificate.